Do you follow the STIB network lines with your finger to be sure not to lose your way (or your head)? Visually hard to read and decipher, the tram and metro map was redesigned and even revamped. But by whom and why? Maxwell J. Roberts is a psychologist and cartographer at the University of Essex. This Englishman is an enthusiast of schematic maps and a collector of metro maps. After years of observation, he decided to give a try to drawing these often complex maps himself. His work was recently put in the spotlight by www.ezelstad.be. After having redesigned the public transport maps of Paris and London, MJ Roberts took on Brussels in 2013. Through straight lines and concentric circles, he successfully manages to give new life to this map. He even gives a symbolic title: Trams and Metros in perfect harmony. M.J. Roberts is interested in the intelligence, inference and solution of problems. The objective of his research is to analyze the way people take in information, how they use it to decide what they will do and why certain people are smarter than others at doing this. According to him, using a metro map to organize a full day requires all one's capabilities. The people's expectations and their opinions are also very important to evaluate a map. If an unusual design goes against their expectations, they will have a negative and unfavorable reaction, even if the map is easy to use. While his map was going viral online, M.J. Roberts took some time to confide about his work. Brusselslife.be: Where does this passion for schematic maps come from? Maxwell J. Roberts: I have always appreciated their ordered appearance and elegance. I've been a collector for quite some time and I realised I prefered old maps to new ones. I then decided to create my own design. By exploring possible improvements, I broke the rules of traditional design to create maps with comfier designs for my eyes. I realised it was a psychological problem, which was close to my field of study. Among the many designers present in your collection, which one left you the biggest mark? Henri Beck's design (Harry by nickname) has no equal in terms of elegance and is in my top 10 best schematic maps of all time. Henri Beck drew in 1933 the map of the London tube. He only used vertical and horizontal segments linked by angles of 45°. Nowadays, Beck's design is used in countless city maps, including Brussels. Did you find inspiration in his work? Not really. Beck used angles a lot, as well as designs based on curves. His sketches inspired me in some way and helped me finish my work work. 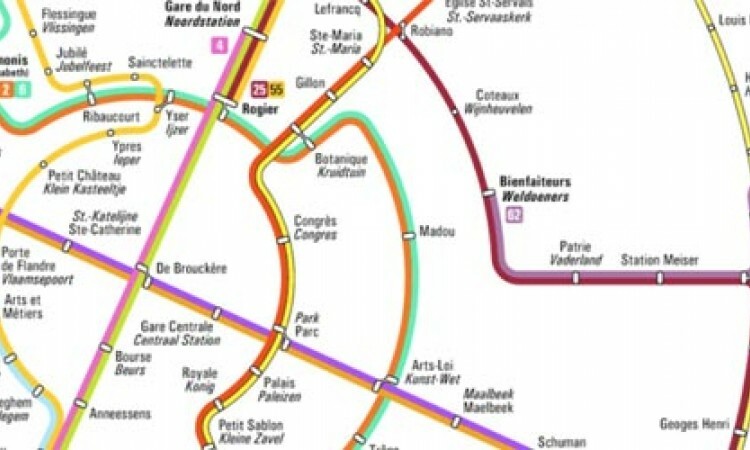 How long did it take you to design the Brussels map? Did you come to Brussels to know more about the STIB network? Brussels is my favorite city. It's compact, there are many pleasant parts of the city to go for a walk, there are countless interesting shops, food is good, as is beer, and I enjoy Art Nouveau architecture. I have visited Brussels several times in the past 10 years and I have gone on every tram and metro of the city. What struck you the most in the public transports in Brussels? I believe the network is under-estimated and is pleasant to use. The markings are clear and taking the tram to the Atomium or the Tervuren woods is always nice. I like a lot the indicators that show the amount of time to wait before the next metro; it's a really clever idea. However, I find the map quite intimidating to use. Having a different color for every route to take makes it hard to read. I prefer the old maps in which all the tram lines are blue and all the bus lines are red. Visually speaking, it was easier to read. Why did you choose Brussels to create this map? Schematic maps are always a challenge! I wanted to try a map with both trams and metros instead of having only one of them. Brussels was stimulating. With this map, people can see the true streets and know that they are not all linear. The Brussels network also has a substantial orbital component that made it ideal for a design with concentric circles. As a tourist in Brussels, I prefer trams to buses. Trams are safer and they very rarely derail, while buses are much more unpredictable. This explains why I decided to make a map with trams and metros and deliberately left aside buses. What about the STIB in all of this?